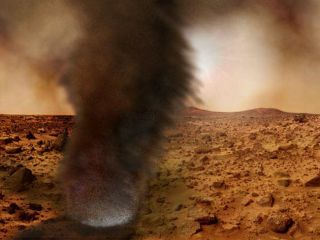 An artist's concept illustrating what an electrified Martian dust devil might look like. The whitish glow near the bottom is the result of an electrical discharge. Matt Balme thought of a tornado when he sawhis first dust devil near Phoenix, Arizona. Now he looks forward to spendingnext summer chasing down dust devils in a four-wheel-drive truck to helpunderstand how such phenomena shape the Martian climate. Scientists suspect that dustdevils on Mars help lift dust into the atmosphere and may feed the planet'sgiant dust storms, but they have yet to directly measure a dust devil on thered planet beyond some pressure readings and a few fleeting images. Terrestrial dust devils are seen as a decentanalogue for their Martian cousins. "We're really hoping to be able toprovide raw data, hard numbers for people doing models for the Martianclimate," said Balme, a planetary scientist who splits his time betweenthe Planetary Science Institute in Tucson, Arizona and Open University in theU.K. The hair-raising research aims to gauge thenumber and intensity of Earth dust devils within a one-square kilometer areabounded by three meteorological stations that will measure wind speed anddirection. Balme and his colleagues hope to link the presence of dust devils toany local "twists" in the wind that get detected by the stations. Tornadoes and other major storm systems arefueled by regional temperature differences. But dust devils are much morelocal. They develop when ground temperatures are warmer than the surroundingair. The rising warm air creates a swirling vortex columnthat catches up dust and other particles as the whole setup races across thedesert, typically at just a few miles per hour. To uncover more about the elusive dustdevils, chase teams of two to six people will race ahead of a dust devil at 40to 50 mph (64 to 80.5 kph) before getting in its path and slamming on thebrakes. That's the signal to use a modified winch on their truck's front end tolower a sensor package that can gauge pressure, temperature and dust-amounts asthe dust devil passes overhead. The swirling vortexes can appear up to 130feet (40 meters) across and almost two-thirds of a mile (1 km) up, making astrange sound between a roaring noise and gentle sigh. "Coming toward you it's quitethreatening," Balme told SPACE.com, describing his first experiencewaiting on a dust devil. However, the dust devil did nothing more than rufflehis hair and throw some dust grains in his face. A bigger problem comes from dust devilsproving, well, devilish. Balme has seen dust devils come right up to the truckbefore heading off in a different direction, leaving the team scrambling toraise their sensor package within a few seconds and go tearing off again. One team will hunt dust devils near Eloy,Arizona, while another team spends time around Nevada's Eldorado Valley. Thedifferent climate areas should help provide a better understanding of how dustdevils can arise even in the cold landscape of Mars. The NASA-backed study will also allow NiltonRenno, an atmospheric scientist at the University of Michigan and member of thePhoenixMars Lander team, to test climate model equations that try to describe howdust devils form. "Rather than just stamp-collecting lotsof measurements of dust devils, we're actually going to try and tie them towhat's going on in the local climate," Balme said. Some changes become necessary to adapt thedata to a Mars model. For instance, the maximum spin velocity of dust devils onEarth is about 50 mph (80.5 kph), while dust devils on Mars may spin up to 200mph (322 kph) because of the thin atmosphere. Dust devils there are known tosoar six miles (10 km) into the atmosphere. Improved climate models should help betterunderstand the whirling dervishes of Mars, at least until future missions canobtain more direct measurements. "It was such a shame when we saw thebeautiful MER [MarsExploration Rover] pictures," Balme noted. "I was thinking that allwe need is a little wind sensor."